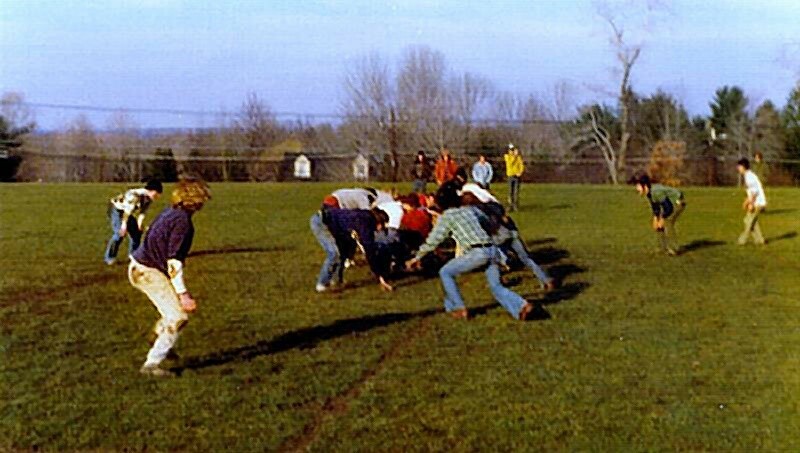 Who can forget the Cromwell vs. Butterworth football games? This one was held at Butterworth field in 1974. Vince. Unknown who's taking pictures. Maybe Peggy. In this photo are Peggy Humphrey (fixing her bra), Kim Boetcher, Lynn Ryan, Vince Borelli, Beth Belote, Bob Roast, Tommy Denman (#50), Jaime (#21), Stan Borelli, Carter, Paul Denz, Pep� Freeman, and others. With Vince quarterbacking, Tommy Denman and Jaime (forget his last name) go out for a pass. Boast and Horace rush. what I remember about those games.� Harry adds, when they called us 'Crumbcake' we replied "What's Butter worth? Nothing." look too happy after Cromwell scores. The below photo was played at Morristown Beard toward year-end of 1975. Again Cromwell vs. Butterworth. brothers rushing in on the other side. Howie can be seen watching from the sidelines. He never played. Unknowned why.